Comfort and clothing have always walked hand in hand at Bodice. Known for its modest approach toward fashion, the brand presented wardrobe staples using indigenous textiles and signature utilitarian silhouettes. Classic and understated hues such as indigo with polka dotted batik work, white, copper and rust gave identity to every piece of layering. Aneeth Arora‘s mission to explore military uniforms, brought classics such as Ray Ban aviators, trench coats, bomber jackets, Dr Martens shoes and khakis to the essential Pero woman’s wardrobe. Keeping androgyny and playfulness alive, the designer introduced Scottish checks from the Himalayas, khakis from Gujarat and enamel brass button detailing from Rajasthan. 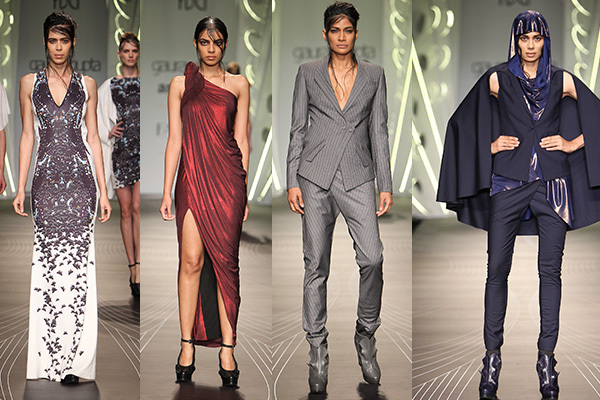 Gaurav Gupta presented a line of power dressing with androgynous pieces such as pinstriped tuxedos, signature frock coats, jumpsuits, asymmetrical jackets, dresses, and gowns with impeccably structured cuts and folds. His signature gothic feel and look was resurrected in tones of black, green, blue, gray and plum. 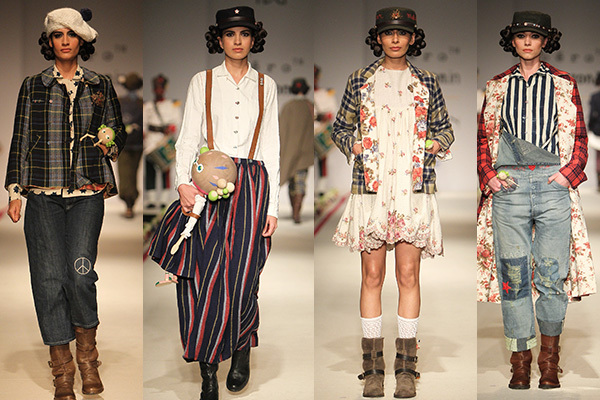 In case you missed it: Day 1, Day 2 and Day 3 of Amazon India Fashion Week.